Building three "Great Walls" across Tornado Alley in the US could eliminate the disasters, a physicist says. The barriers - 300m (980ft) high and up to 100 miles long - would act like hill ranges, softening winds before twisters can form. They would cost $16bn (£9.6bn) to build but save billions of dollars of damage each year, said Prof Rongjia Tao, of Temple University, Philadelphia. He unveiled his idea at the American Physical Society meeting in Denver. However critics say the idea is unworkable, and would create more problems than it solves. Every year hundreds of twisters tear through communities in the great north-south corridor between the Rocky and Appalachian Mountain ranges. The proposed walls would not shelter towns - they would not be strong enough to block a tornado in motion. Instead, they would soften the clashing streams of hot southern and cold northern air, which form twisters in the first place, Prof Tao said. "If we build three east-west great walls, one in North Dakota, one along the border between Kansas and Oklahoma, and the third in the south in Texas and Louisiana, we will diminish the threats in Tornado Alley forever," he said. As evidence, he points to China - where only three tornadoes were recorded last year, compared to 803 in the US. China too has flat plain valleys running north-south, but the difference is they are broken up by east-west hill ranges. Although only a few hundred metres high, they are enough to take the sting out of air currents before they clash, Prof Tao believes. Back in the US, he notes that the flat farmlands of Illinois experience wildly varying risks of twisters. "Washington County is a tornado hotspot. 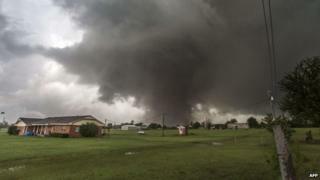 But just 60 miles (100km) away is Gallatin County, where there is almost no risk," he told BBC News. "Why? Just look at the map - at Gallatin you have the Shawnee Hills." These act like a barrier 200-250m (820ft) high, protecting Gallatin, he says. "We may not have east-west mountain ranges - like the Alps in Europe - we can build walls." "We've already been doing computer simulations and next we aim to build physical models for testing [in wind tunnels]." Rather than create an eyesore, the walls could be "attractively" designed, says Prof Tao. He cites the Comcast skyscraper in Philadelphia - also about 300m high, and built with a reinforced glass exterior. "Our tornado wall could even be built of glass too. It could be a beautiful landmark," he told BBC News. "I spoke to some architects and they said it's possible. It would take a few years to finish the walls but we could build them in stages." Prof Tao has yet to approach government or environmental agencies with his scheme, but the reaction from meteorologists has been highly sceptical. Harold Brooks, of the National Severe Storms Laboratory, said the great walls "simply wouldn't work". He told USA Today that tornadoes still occur in parts of Oklahoma, Arkansas and Missouri despite east-west hill ranges similar in size to Prof Tao's proposed barriers. Another leading tornado expert, Prof Joshua Wurman of the Center for Severe Weather Research, was equally dismissive of Prof Tao's proposal. "Everybody I know is of 100% agreement - this is a poorly conceived idea," he told BBC News. "From what I can gather his concept of how tornadoes form is fundamentally flawed. Meteorologists cringe when they hear about 'clashing hot and cold air'. It's a lot more complicated than that." Though much of the blame does lie with warm air rushing north from the Gulf of Mexico, stopping it would be nigh on impossible, Prof Wurman says. "Perhaps if he built his barrier on the scale of the Alps - 2,000-3,000m (9,800ft) high, it would disrupt it," he says. "But clearly that would also cause a drastic change in climate." And there lies the real crux of the problem, says Prof Wurman. Any geoengineering scheme powerful enough to eliminate tornadoes would also by definition have catastrophic side effects. "The cure could be worse than the disease," he told BBC News. "So the solution to tornadoes is not trying to get rid of them. "It's better predictions and warnings so people can get out of way. Better homes. Better shelters." He added: "Don't get me wrong, I'm open to new ideas. I consider myself an out-of-the-box thinker. But just because an idea is heretical, doesn't mean it's a good one."